Adam Treloar was the dominant player on the ground today, with equal gamehighs in disposals (29), handball-receives (15), score involvements (12) to go with 17 pressure acts and 1.1.2 (17). Collingwood won this game by controlling the possession of the football, winning 106 more uncontested possessions and recording 97 more disposals, but the Tigers refused to go away, recording two more forward 50 entries than their opponents. Dustin Martin kicks a goal and brings the Tigers within a supergoal of the lead, after at one point being more than seven goals down. 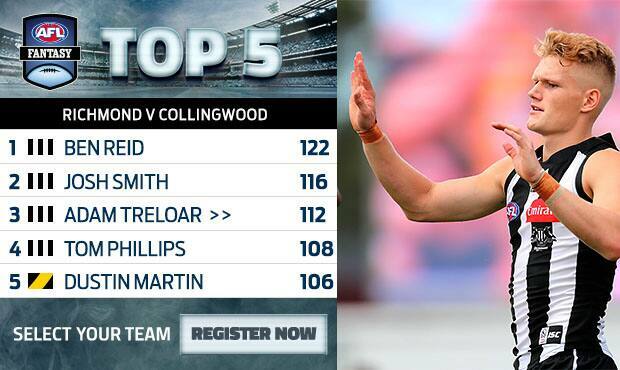 Collingwood are leading the disposal count by 93 disposals, and have 11 players with 20 or more disposals. They only bettered that disposal differential once in 2016, against Gold Coast in Round 22. A great mark to rookie draft selection Tyson Stengle allows him to kick the goal and bring the Tigers within 13 points of the Magpies. 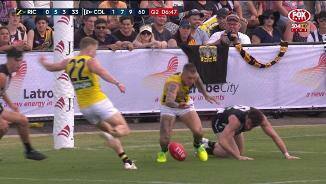 Jack Riewoldt set that up by bringing the ball to ground for Trent Cotchin, but rolled his ankle in the process. Collingwood are content to chips the ball around their backline to eat up time, with six defenders all on six disposals each leading the rest of their teammates in this quarter. Since the 12 minute mark of the final term, the Tigers have recorded four more forward 50 entries than Collingwood but have only managed 1.1 (7) from these entries. Daniel Butler has been a find for the Tigers this preseason after a few unfortunate knee injuries since he was drafted by the Tigers in 2014. He has averaged four inside 50 entries and 4.5 tackles per game this preseason, both teamhighs. Ivan Soldo helped the Tigers kickstart their final term with a teamhigh four disposals, three marks and 146 metres gained. Jesse White's second goal extends the lead for the Magpies back out to 25 points. After a slow start, the Magpies have chosen to use the ball by hand a lot more than their opponents, with a kick to handball ratio of 1.06 compared to 2.00 for Richmond. Great start to the final quarter for the Tigers, with two goals coming from stoppage clearances, 100 per cent disposal efficiency and eight uncontested possessions to one to begin this final term. Ivan Soldo kicks a great goal from the boundary with his first kick of the match. That makes it three straight goals to the Tigers and they're back within five goals. Steele Sidebottom had mixed success that quarter, with teamhighs in uncontested possessions (seven), marks (four), Inside 50 entries (four), and score involvements (three) but he also had a team-high five ineffective kicks. Once again the scoring efficiency from the Magpies from stoppages has been on display, scoring 17 more points than their opponents from seven fewer clearances. Jason Castagna kicks his first goal of the match and looks to be a solid player for the Tigers, having averaged two goals per game across the preseason, which is the equalbest mark in that category for Richmond. Jack Riewoldt gets his second goal for the quarter to get the margin back below 40 points. The Tigers have had the majority of field position this quarter, having spent 60 per cent of the third term in their forward half, but haven't converted well. Richmond InterchangeMabior Chol off due to an injury. Mason Cox has had a good third quarter, with a teamhigh three free kicks for, three contested possessions and two inside 50 entries. Darcy Moore has only had six kicks in this match and has been otherwise not very prominent, but he's done his job so far with a gamehigh three goals, including that last one to extend the lead 45 points, also a game-high. That goal to Chris Mayne makes it five from five goals scored from Intercept Possessions and his second goal for the match. From the same amount of forward 50 entries this quarter, Collingwood have kicked three more goals than their opponents. A goal to Dustin Martin steadies the ship for the Tigers and he's trying to take his team with him with a teamhigh four disposals and three contested possessions. Despite winning the clearance count by four to two this quarter, the Tigers are being sloppy with their disposal, conceding all four goals in the third term via giveaways. Great work by Mason Cox to win the free kick and launch that goal to Tom Phillips who has had a great preseason and pushed his case for a spot in the round one Magpies team. He has 14 disposals and eight handballreceives so far today. 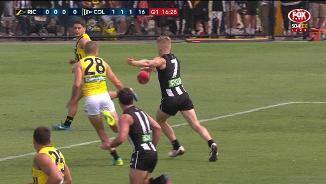 A nice finish for Jack Riewoldt's first goal of the match to answer Darcy Moore's goal a few minutes ago. The Tigers are refusing to go away in this game, and have kept the ball in their forward half for 55 per cent of this quarter so far. Josh Smith adds a goal to his tally and gets the Magpies off to a good start in the third term. The magpies are dominating the uncontested possession count in this game and have continued that in this term with a 11 to five lead in that count. Josh Smith has made an encouraging return from the injury he sustained in the first preseason match, recording 15 disposals, three marks, eight handballreceives and one behind. After having just 13 disposals between them in the first quarter, Cotchin, Martin, Caddy and Prestia stepped up to share 25 disposals and three goals in the second quarter. Collingwood outgained the Tigers by almost 600 metres in their forward half in the first quarter, lead by 220 metres gained by Adam Treloar. But the Tigers reversed that trend in the last term with just under 370 metres more gained in their forward half. Collingwood end the run of three straight goals to Richmond with a goal to Jesse White. Since the 20 minute mark of this term, the Magpies have played on from nine of twelve marks, including the mark that White took on the goal line to kick that goal. A behind to Taylor Adams accentuates the Magpies issues kicking for goal this quarter, as they have only one goal from nine entries inside 50. They rank first in the AFL this preseason kicking a goal from 34 per cent of inside 50 entries. Richmond have flipped the script this quarter, and kicked three goals in a row in just over five minutes of play. 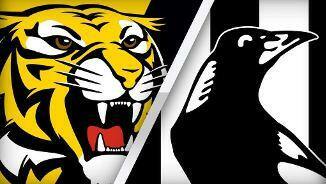 The Tigers have lifted their kicking efficiency to 77 per cent for this quarter, compared to the Magpies 60 per cent efficiency by foot. Josh Caddy kicks his first goal for the match and the Tigers first backto-back goals. All three goals to Richmond have come from turnovers this quarter. They average eight goals per game from this source across the JLT Community Series. Richmond InterchangeSam Lloyd off due to an injury. 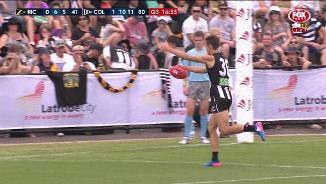 Fasolo launches his own goal by winning the free kick then running hard to get the mark in front of goal. The Magpies have now kicked seven of their eight goals from set shots, with Treloar's supergoal the only goal not to come from a set shot. Dion Prestia kicks the first goal of the second quarter and the Tigers third goal for the match. Prestia had a very quiet opening to the match recording just two disposals in the first quarter, which he's matched in the second quarter already. Jack Riewoldt is stepping up the defensive pressure to try and kickstart his teammates, with two tackles and three pressure acts so far this quarter, both teamhighs. Mabior Chol gets the Tigers on the board in the second quarter with his second behind for the match. The Tigers have been harder at the stoppages this quarter so far, winning four clearances to none. Adam Treloar caps off a great first quarter for both himself and his team by extending the lead to 38 points at quarter time. The Magpies had 129 disposals that quarter, which is more than in any quarter of their matches in 2016. Shaun Edwards capitalises on a lazy Magpie kick and kicks the Tigers second goal. Both Tigers goals have come from Intercept Possessions, which is an area of weakness for Collingwood, who have conceded the most points from this source in the preseason. Reece Conca has been everywhere in the first quarter, with 11 disposals, eight uncontested possessions, five handballreceives and one score launch, all team highs. Another goal for the Magpies who are being extremely efficient when going inside 50. They have registered seven scoring shots from 10 entries compared to the Tigers two scoring shots from seven entries. Collingwood's kicking efficiency to start this match is giving them a distinct advantage, as they are kicking at 71 per cent efficiency compared to 48 per cent kicking efficiency for Richmond. Darcy Moore kicks the Magpies fourth goal, the third goal from a set shot already in this quarter. Last year Collingwood averaged just under seven goals per game from this shot type in the Home and Away season. Mabior Chol kicks the Tigers first goal of the match to get them on the board after missing his first shot a few minutes ago. He will be looking to try and force his way into the side after only one match in his debut season in 2016. Adam Treloar kicks the first supergoal of the match. With Scott Pendlebury a late out for this match, Adam Treloar will be asked to lead the midfield group and he has started off the match well, with four disposals and four handballreceives. Collingwood kick the first goal of the match through Alex Fasolo, launched from a Jeremy Howe Intercept Possession. The Magpies are using the ball very efficiently, going at just under 90 per cent efficiency. Collingwood have been outstanding at launching scores from stoppages in the 2017 JLT Community Series. They average 59.5 points per game from 32.5 Clearances per game, by far the best strike rate this preseason. Toby Nankervis has cemented himself as the Tigers starting Ruckman for the 2017 season. After requesting a trade from the Swans after two seasons and 11 games, he has the secondhighest hitout-to-advantage rate among the top 20 ruckmen this preseason. 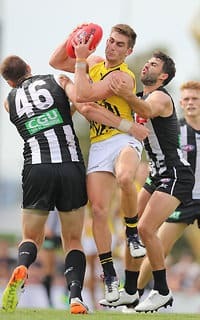 Richmond have gone in with a slightly younger side than Collingwood with nine players with over 100 games experience selected and seven players with less than 20 games experience chosen, including three players yet to debut in the Home and Away season. Collingwood have selected a wellexperienced side for their final match of the preseason, featuring 11 players with more than 100 games experience, and just five players with less than 20 games experience, including zero players yet to debut. Welcome to Ted Summerton Recreational Reserve for the Richmond v Collingwood Round 4 clash. BEN REID has underlined his importance to Collingwood's fortunes in 2017 with a commanding display as the Magpies outlasted Richmond by seven points in their JLT Community Series clash in Moe on Saturday. Reid was in splendid touch, collecting 26 disposals and 18 marks (three contested) to stamp himself as the Magpies' best player alongside gun midfielder Adam Treloar in the 1.15.15 (114) to 0.16.11 (107) victory. On the comeback trail from off-season knee surgery, Reid has patiently built up his workload, even suiting up in a VFL practice match in February, to ensure his availability for round one. With skipper Scott Pendlebury a late withdrawal due to Achilles tightness, Treloar picked up the slack and led the way beautifully in a best-on-ground performance. Treloar got rolling from the outset, kicking a goal and a supergoal in the first quarter and finished his day with 29 disposals. Young Pie Tom Phillips did his chances of a round one appearance no harm with another fine pre-season performance, the endurance king picking up 24 disposals. Jackson Ramsay, returning from a torn anterior cruciate ligament sustained in April last year, was also busy in defence with 28 disposals. The Magpies were in control from the get-go, leading at every change and they often looked like they would charge away to a dominant victory. But star Tiger Dustin Martin (26 disposals, six clearances and three goals), following a week where his contract discussions dominated the headlines, lifted in the latter part of third term after the Magpies booted four goals in the space of 12 minutes to start the quarter. Despite Collingwood's early dominance, the Tigers cut the margin to just seven points at the final siren as the Magpies ran out of steam. 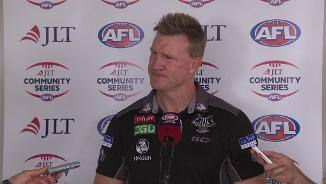 "We did throw it around and tried a few things in the last 40 minutes," Magpies coach Nathan Buckley said. "There's no doubt that we felt the (effects) of the longer game, with the cap rotations, so fatigue kicked in a little bit. "We weren't as clean late but when the game was up for grabs early we were happy with our ability to put heat on Richmond and then use the ball cleanly to get out of that." Although he had just 12 disposals for the afternoon, rookie Tiger Mabior Chol showed flashes of his potential while oft-injured midfielder Reece Conca had 24 touches. 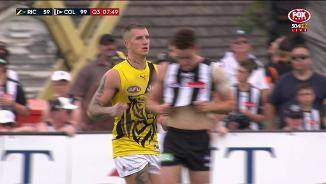 A late ankle injury to Jack Riewoldt, who was reported for rough conduct earlier in the game, caused some concerns but the spearhead, who booted two goals, appeared to be walking freely when he shook hands with the opposition after the siren. Collingwood still has to fit Daniel Wells, Jamie Elliott, Tom Langdon, Jordan De Goey, Levi Greenwood and skipper Pendlebury back into its best 22 as competition for spots heats up. 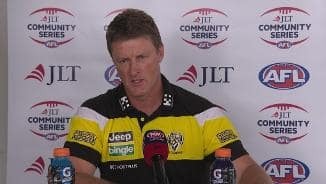 The Tigers were without Ben Lennon and Corey Ellis, and after a dismal start coach Damien Hardwick would have been content with their fightback and increased pressure around the footy. "We started poorly. The first quarter was not something we want to replicate going forward but then three quarters after that made for a pretty even contest," Hardwick said. "The disappointing thing was the way we started. Collingwood got the better of us around the scrimmages and played the ball in their half. We'll have a look at it and see if we can rectify it." 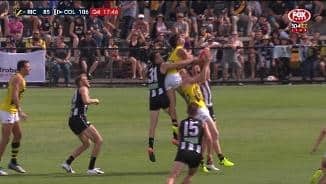 Richmond: The Tigers have spent all summer working on a patented style of fast ball movement but, as the first half against Collingwood proved, it can all come unstuck if the pressure around the ball is not where it needs to be. Richmond was smashed in the first quarter as its front-half pressure was non-existent and it allowed the Magpies to move the ball freely and crisply. Once they turned up the intensity around the footy, the Tigers performed much better. But the inconsistency is a little worrying. Still, a 2-1 win-loss record across the pre-season remains a positive for Damien Hardwick's men. Collingwood: Collingwood has a number of selection dilemmas ahead of round one. Scott Pendlebury (Achilles), Levi Greenwood (hamstring), Jordan De Goey (quad) and maybe Jamie Elliott (ankle) will be looking to force their way back into the side for the opening round clash against the Western Bulldogs. Rookies Henry Schade and Mason Cox both look on the cusp of being elevated to the senior list, one in place of the injured Ben Sinclair, after excellent performances over the pre-season. If all of Pendlebury, Greenwood, De Goey and Elliott are fit, that means four players need to drop out. Some tough decisions await Nathan Buckley and his match committee. Richmond: After a quiet start to the game, former Sun Dion Prestia made more of an impact with two goals in the second quarter. Ex-Cat Josh Caddy spent much of his time up forward but was quiet, while Toby Nankervis fought back in the second half after being beaten by Brodie Grundy early in the game. Mabior Chol caught the eye and seems to have taken steps in his development as he looks to play regular senior footy in 2017. Fellow rookies Tyson Stengle and Ivan Soldo both sat out the first half before coming on to kick goals late in the contest. There are two spots on Richmond's primary list available, after Shaun Hampson was placed on the long-term injury list. Collingwood: Ex-Docker Chris Mayne got his confidence levels up early with a goal in the opening term, and he finished the day with two majors and 13 touches in his best performance for his new club. Henry Schade, formerly of Gold Coast, was solid in defence and has put himself in line for an early-season debut in his new colours. Schade appears to be ahead of Lynden Dunn in the race of the second tall defender spot, with the former Demon only featuring in the second half. Will Hoskin-Elliott should be a certain starter in the Magpies' round one team, with his athleticism and versatility adding a point of difference. With the JLT Community Series done and dusted, both teams will be part of the early games in round one. Richmond opens the home and away season against Carlton at the MCG on March 23, while the Magpies face the Western Bulldogs the following night at the same venue.